If you’ve ever looked at the ocean and asked yourself, “what are you good for?” You can’t drink it or even reap the benefits of it. Well there is one way you can, the kelp. The founders of AMA Seabeauty have harnessed this underused green specimen to bring skin to life. Ama SeaBeauty‘s new home at 506 State St. is the perfect place for the company’s unique vision to reach the heart of Santa Barbara—that healthy, beautiful skin is attainable, sustainable and affordable. Emphasizing sustainable practices and earth-friendly manufacturing processes, Ama SeaBeauty aims to demonstrate that healthy, beautiful skin is attainable, sustainable and affordable. The company brings a unique vision of improving skin health and sustaining skin’s youthful vitality. SKIN CARE PRODUCTS THAT DID WONDERS FOR MY SKIN! In the past month, I've been lucky enough to come across a small company with a line of products that did WONDERS for my skin! Being a small company, when the owner told me she'd send me some products, I expected one or two and for them to be pretty "generic" but I was so excited to be wrong! She has a wide selection of products and all of them were far beyond average! And to top everything off, THE PRODUCTS ARE NATURAL AND MADER BY HER PERSONALLY! Talk about a win win situation. Ama SeaBeauty utilizes hand harvested seaweed extracts and fresh dried sea vegetables. Please refer to the brand’s website for more info on Thalasso Therapy as it is described beautifully for you HERE! Like these Japanese divers, Marquez plunges beneath the waves in search of nutrient-rich seaweed and other marine ingredients, which she then uses to create the assortment of all-natural beauty potions offered as part of her thalassotherapy skin treatment (thalassotherapy being any cosmetic and health treatment that uses seawater). In order to harvest kelp in a sustainable fashion, one must follow guidelines regarding the placement of the open-water farm and everything from that point onward. Some of the conditions to finding a good farm location include: current strength, nutrient amount, protection from storms, limited use from commercial fisheries that could overuse the resources, specific depths, not in habitats that would endanger species, and far enough from state-owned piers or structures. Thalasso Therapy...the use of seawater and marine-based materials in cosmetic and health treatment. 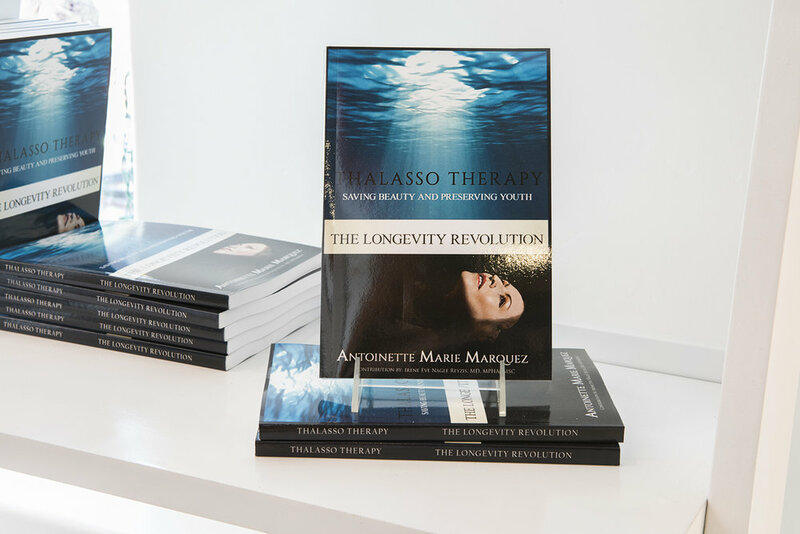 Today we are speaking with Certified Thalasso therapist and the author of "Thalasso Therapy - The Longevity Revolution" Antoinette Marquez. The concept of Ama SeaBeauty was developed because Antoinette needed a holistic beauty approach. She would not have injections or chemicals on the skin. Experience Ama SeaBeauty products and Thalasso beauty rituals at the FaceBar. We bring you sea, salt and seaweed as a natural human preservation system. At Ama SeaBeauty FaceBar we can show you how to keep beauty from slipping away!